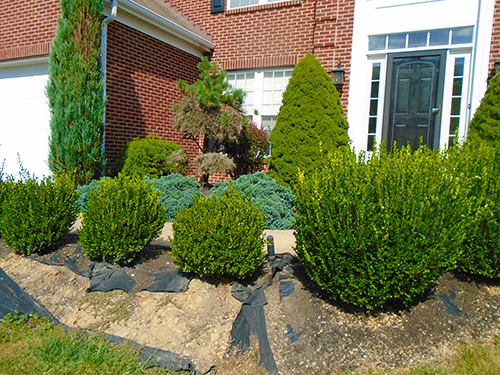 Our landscape installation crews are comprised of respectful men and women. We boast the fact that as many other companies turn to immigrant workers that don’t speak English, our personnel are all American citizens. We put our employees through rigorous training so as to produce competent workers that understand the importance of doing a good job. We use only the best products for our landscape installations. Our plants come from our own garden center and our trusted reputable growers with a knack of maintaining the highest standards in the industry. Our mulches and soils are not polluted with additives that compromise quality. Our blocks and pavers meet or exceed all ICPI standards in the hardscaping industry. As we transform your property, our crews leave the site in a clean condition. We constantly communicate with our customers as the work reaches certain stages. At the successful completion of the landscape installation project we are happy to do a walk through with the client and go over all facets of the new installation. Landscape maintenance is discussed at this time as well as watering obligations to prevent plant damage due to drought. We strive to make the process a positive experience for you and your family.